It just keeps getting better! 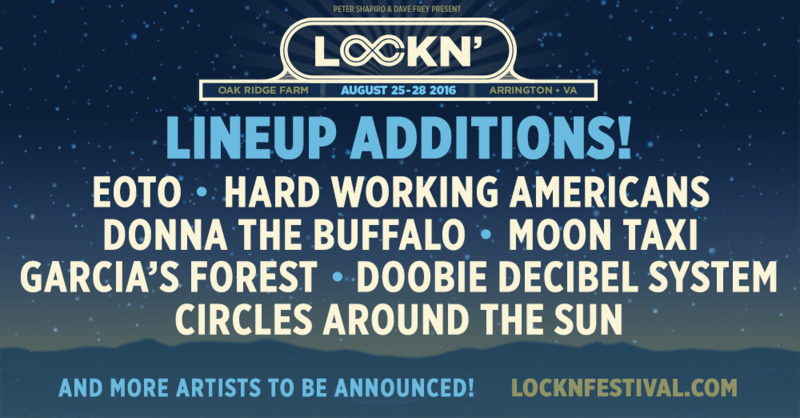 We’re excited to announce several additions to the growing LOCKN’ 2016 lineup. Returning to LOCKN’ are EOTO, the all improvised electronic project of The String Cheese Incident’s Jason Hann and Michael Travis who will take us on a spontaneous musical adventure of sounds and rhythms. Having blown us away last year during Mickey Hart’s “Deep Rhythm Experience,” we’re looking forward to seeing them throw it down once again. Also joining are Hard Working Americans, a rock super-group featuring Widespread Panic’s Dave Schools and Duane Trucks, Neal Casal of Chris Robinson Brotherhood, Todd Snider, Chad Staehly, and Jesse Aycock. They will make their debut at LOCKN’ performing melodic rock creations that flow with talent and creativity. Another first-timer at LOCKN’ this year are Moon Taxi, and if you haven’t taken a ride in their amazing musical lunar vehicle, you’re in for a real treat. Their soaring guitar solos and melodic grooves will make for the perfect summer soundtrack at LOCKN’. Roots-rockers Donna the Buffalo, veterans in the scene whose music traverses the boundaries of Americana, have been capturing the hearts of audiences for 30 years. We have no doubt that their bright and sunny sounds will fill us with positive energy this summer. Circles Around The Sun is the intoxicating project of Neal Casal that captivated fans during intermission at last summer’s Fare The Well shows. Casal’s psychedelic freewheeling jams have quickly become cult favorites. The eclectic duo of The Doobie Decibel System features Moonalice’s Roger McNamee and Jason Crosby. Crosby is known for his work collaborating with artists like Phil Lesh, Bob Weir, and Carlos Santana. The power duo will take us on a journey through the decades that will not soon be forgotten. Rounding out the new additions is the Garcia’s Forest, a late-night dance party featuring endless good vibes and a kaleidoscope of energy. While the music of Jerry Garcia flows through the trees, the magic of the Garcia’s Forest will come alive.